If you are looking for a simple, no frills Belgian waffle maker then the BELLA classic rotating waffle maker is a great place to start. For a little under $30, you get a super shiny, stainless steel or copper machine that looks like something the pros would use! With a non-stick grill, a convenient to clean drip tray and a useful know to control the temperature, this machine looks like it has it all. Before I give you my opening thoughts, I wanted to let you know I did an in-depth video review of the Bella Waffle Maker, so you can see it in action. I show you how it works and even make a waffle using our amazing waffle recipe! Upon taking the BELLA waffle maker out of the box, it feels like a sturdy machine (which is great because I plan on making a lot of Belgian waffles!) The removable drip tray is easy to put in place and is made of dishwasher safe plastic. While the plates of the BELLA waffle maker are not removable, they are covered in a non-stick coating which should make them easy to just wipe clean. The stainless steel version we tested was so shiny that I was afraid to touch it and leave finger prints (check out our blog about cleaning your waffle maker, just in case you do get finger prints on that shiny surface!! I also immediately noticed the handle on the waffle maker that folded in half to make it smaller to store- a great feature if you are short on space! The Bella Classic Rotating Waffle Maker has a knob right on top that controls the temperature of the waffle plates. Do you like extra crispy waffles? Simply turn the temperature up! The blue indicator light on top of the waffle maker will tell you when the plates are hot and there is also a light on the bottom to tell you when the waffles are done. Nice and easy- the way Belgian waffles should be. I plugged this little waffle maker and the power light on top immediately went on-off to a great start! I set the dial to medium and when the blue ready light came on, I poured in the recommended 1 cup of waffle batter (using, of course, our perfect waffle batter recipe!). A quick 180 ̊ flip of the waffle maker and we're off! About a minute after I flipped over the waffle maker, the bottom indicator light came on which is suppose to tell me when the waffles are done. I found this strange as the BELLA manual said the waffles would take about 3-5 minutes. I flipped the machine over to check and the waffles were super pale and did not look done (however the top plate came off very cleanly- yay for non-stick surfaces!). I decided to close the waffle maker, flip it back over and wait another few minutes. All the while, the indicator light was telling me the waffles were done…. Reading some Amazon reviews show that lots of people had this issue as well- at least I know my machine wasn't broken! After letting the waffles cook for about 6 minutes total, I took another look- still pale! I took the waffles out of the machine and they came off the tray's very easily but had a cakey, dense texture rather than being like a nice crispy, fluffy waffle. I tried another batch with the heat set to high and had the same results. I also tried making a new batch of waffle batter but no matter what, the BELLA Rotating Waffle Maker produced pale waffles. While the Belgian waffles tasted good, they didn't have that nice golden brown color. It only took about a minute to heat up - nice and fast for busy mornings! The indicator light to signal when the waffles were ready didn't seem to work and came on too soon, before the waffles were done. Although the stainless steel was really nice and shiny when fresh out of the box, fingerprints were very apparent. But you can always get the black version of this machine to avoid the issue! The BELLA Classic Rotating Waffle Maker has many upsides that I look for in a waffle maker. With nice deep non-stick waffle plates, it makes a very thick Belgian waffle and is easy to clean. The price is also great for a waffle maker that feels like it will last a few years. Not making crispy waffles makes me hesitant to fully recommend this machine as there is nothing better than a golden brown Belgian waffle. But check out our video review to see in real life how the BELLA works! 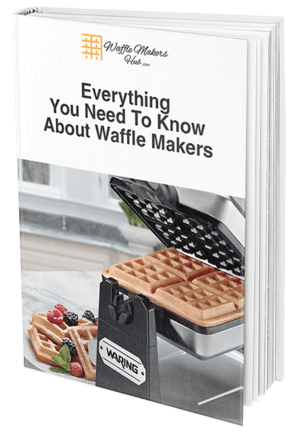 Take a look at our Ultimate Buying Guide﻿﻿﻿﻿ as well for a comprehensive way to purchase your next waffle maker.